For a long time Intel does not present the X series chipset. The last time Intel bring it through the Intel X58 chipset, after 3 years since the first release in November 2008. Intel X79 chipset codenamed Patsburg was first introduced in November 2011. And already become Intel characteristic by presenting chipset to always put a high-end X series to be paired with a new processor. If Intel X58 was introduced simultaneously with the Nehalem processor, X79 release coincided with the expectation of an Intel Sandy Bridge-E, which uses the new socket LGA2011. LGA2011 socket has a pin count for more. The goal is to enable the flow of data via the PCI Express bigger so it has a strong performance. LGA2011 socket design is also slightly different than the previous socket. You will not find a heatsink locking methods as in the previous socket. On LGA2011, used method of using bolt bracket mounted on the processor socket. It would be more secure and comfortable than using a previously socket which often pose a risk of fracture at the pin. X79 processors include support for Intel Sandy Bridge-E series Intel Core i7-38xx to 39xx. Some other new features include support for up to quad channel memory (utilizing all 8 DIMM slots DDR3 memory speeds up to 1600 MHz). His position was made around the area of the processor so that it looks more “frightening”. As an upper-class chipset, Intel X79 offers a high performance support and enable activity overclock on the CPU and memory. X79 can also make improvements to the PCI Express controller. Here you will find a PCI Express 3.0, which has a bandwidth of 8 GT / s, PCI Express is greater than 2.0. You will also find some graphics slot motherboard with a number of more up to 4-way SLI or CrossFireX mode. It’s just full x16 bandwidth applies only to the first two slots. 14 SATA connections are also available there, with 10 of them can handle data transfer up to 6 Gb / s, plus 14 USB 2.0 ports. However, support for the PCI slot is no longer available. 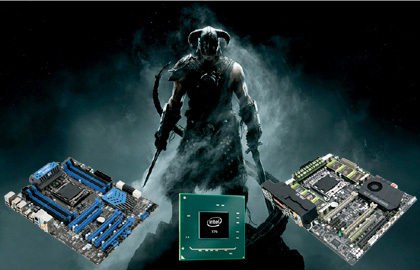 However, some motherboards still include these slots because there are many users who need it. Surprisingly, the X79 does not yet support USB 3.0 and still use another chip to handle the additional connection via port. Some manufacturers are competing to bring motherboards Intel X79 chipset. As a small illustration, we present Asus Sabertooth X79 and MSI X79A-GD65 (8D) are already on the market.